They used to watch the Sun together. The Boy and the Old Man. The Boy was an early riser. He would hop out of bed, and tiptoe through the house not to wake up the others. Panting, one by one he would carry big heavy phone books, and pile them up on top of a flimsy desk below the basement window. He would build a tower until it was just tall enough for him to reach the latch. Then he would begin his journey up. Slowly and carefully…first to the top of the desk… then, holding his breath, and balancing, even higher up…until both his little feet were planted firmly on the very top of the tower. The Boy would unlock the window, and stick his head right onto the street. Funny, how after all that climbing he would still be on the ground! Then he would turn his head to the left, and sure enough, he would be there, limping towards him. The Old Man. The Boy would wave, and the Old Man would wave back. 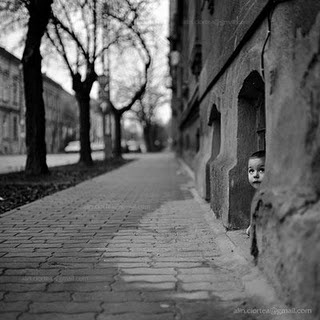 He would come, and sit down heavily on the pavement next to the Boy’s window. He would lean against the wall, resting. He was old, the Old Man. And tired. But his eyes were young still. They would talk about things, the Boy and the Old Man. The Boy would bring his worries to him, and the Old Man would take them in his withered wrinkled hands, and turn them into dust. And then he would tell the Boy of the wonderful distant lands, where men were strong, and women were all kind and beautiful. He was full of stories, the Old Man. And all of them were true. And one day the Old Man did not come. And the day after… The Boy kept looking for him. He forgot all about the Sun. Day after day he waited, hoping with all his big little heart to see the Old Man again. But the Old Man never came. The Boy’s heart became heavy with worries, and his eyes grew old with sadness. But then he remembered what the Old Man said. In the hour when the world renewed itself once more, the Boy looked up. Sure enough, the Sun climbed atop the sky. It beamed right at him, warming his heart, and melting his worries. It filled his eyes with dancing sparkles of laughter. Still grinning, the Boy began to climb down, but something made him stop. He looked up one last time, and the star – so distant and wonderful, so strong, beautiful, and kind – looked back at him, and winked. I had given you your propers at Flashy Fiction, but this story deserves to be touted one your own turf. I had found Flashy Fiction at the mention by RJ Clarken, one of the "promptesses". It has fallen to a point where the ladies stop prompting. But I think there is something special about FF and am trying to urge the ladies to continue. We have a great group at Poetic Bloomings, and I knew we could drum up some interest. Hopefully, RJ can get the rest of the girls to get it running again. We'll see what we can do to help. Thanks for your contribution. Thank you, Walt. This is actually very 'my thing', I love writing short essays, or something that I guess may fall into the Flashy Fiction category. I'll definitely be checking the prompts.